Published March 24, 2014 at 205 × 300 in Spiritual. Prophecy All creatures live on this earth plane. They are protected by the ozone layer and by our balanced use of resources. 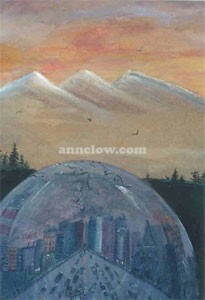 The dome around the earth symbolizes two things: the ozone layer cracking or being depleted by our imbalances, and a crystal ball foretelling a possible dark future if nothing is done about how we use the earth and each other. Balance can be restored by developing a deep reverence and respect for all life on this planet.